This from the Safeway where Tim works. I don't know how something can only kind of be a "thing". Maybe they don't need to be done daily REALLY. 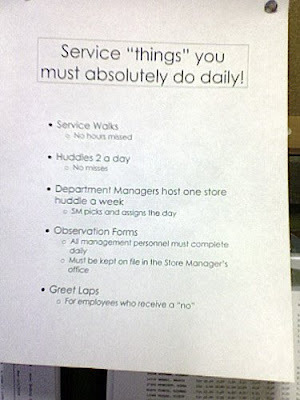 I also have no idea what it means for an employee to receive a "no" or to have a huddle. So maybe they really aren't things. I like how a weekly huddle is listed as something you must do daily. No, no, it was using "things" euphemistically. Like, you know, a guy's "thing." what is a huddle and how might one host it? and i've just gotta say, the only kind of greeting i've ever gotton from a lap is definitely not work-appropriate.